Tyrone Clarke, the eldest son of Open Champion, Darren Clarke is looking to create golfing history next July at Royal Portrush. The 20-year old is planning to try and qualify for golf’s oldest Major when it returns to the famed Co. Antrim course for a first time since 1951. Tyrone is no stranger to Royal Portrush where he plays off an impressive +2 handicap, and with the course located very close to the Clarke palatial abode. 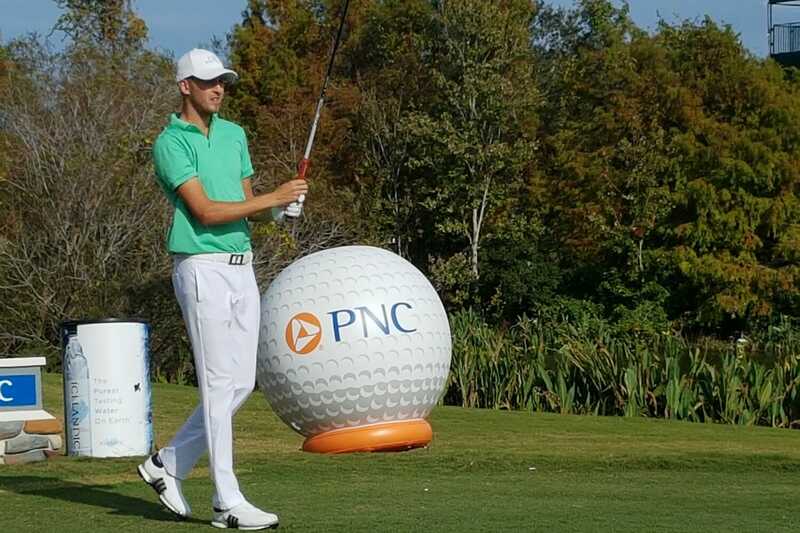 “I’d love to try and qualify for The Open especially as it’s returning to Royal Portrush,” he said ahead of today’s (SAT) start to the two-round PNC Father-and-Son Challenge in Orlando. “I will first have to tee-up in a Regional Qualifier, and wherever that may be staged, and if successful I then have to get through a Local Qualifier and it I get through that, it’s then onto Final Qualifying. “So, there’s three big steps I will have to climb if I’m to qualify but it would be amazing if I could succeed and join dad in The Open and what is golf’s oldest Major and with dad being a former Open Champion. “Though in saying that, I have a lot more work to do on my game before I could there. And would Tyrone like to eventually follow his father into the pro ranks? “Well, I will have to think about that but I have not ruled it out,” he said. “Dad has given me a lot of advice which has been helpful but I would not go as far to say I am that good a golfer that I could turn pro as soon as I finish my degree. Indeed, Tyrone plays for Lynn University, winner of the NCAA Division II national team championship last season and while missing out on selection he’s got his championship ‘ring’ and has been practicing five-to-six days a week to now be No. 3 on the university golf team. “I don’t hit it a mile, but I’ve got a pretty good short game,” he said. And with a Major Champion as a father it begged the question whether Tryone has began taking money of his father and a winner of 21 worldwide tournaments including his emotional three-shot success seven years ago at Royal St. George’s. “Yeah, I’ve taken a bit of cash off him when we’ve played on holidays out in the Barbados on the Green Monkey course so that’s been good,” said Tyrone smiling. It is understood the last time a father and his son teed-up in a major was the 2014 Masters when Craig Stadler, and winner at Augusta National in 1982, was joined by then 34-year old son Kevin. You would have to go back to the 1860s and 1870s when Old Tom Morris and his son, Young Tom along with Willie Park Senior and his son, Willie Park Jnr each played in the same Open. Earlier this year Sam Broadhurst, and the 21-year old son of Ryder Cup star, Paul, went within one Final Qualifying round of joining his then Senior British Open winning father in qualifying for the 2018 Open at Carnoustie.